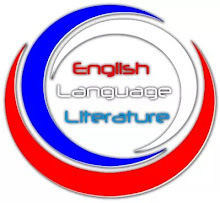 Despite the fact that I don't charge people for my online English tutorials, they have refused to learn. Some will even ask me, "who English epp?". “Wehdon sir”! My happiness is that the English language is no respecter of person. No matter who you are in the society, if you don't embrace it, it will embarrass you without a second thought. 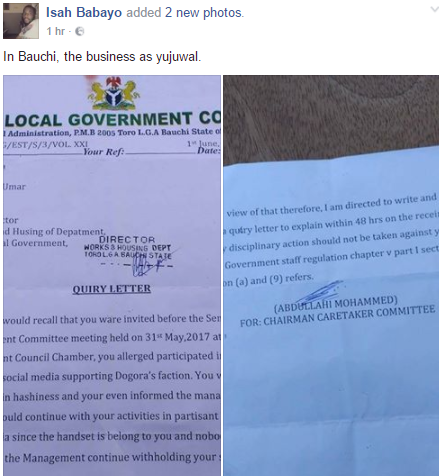 This is actually a query letter from Toro Local Government in Bauchi State, signed by Abdullahi Mohammed on behalf of the chairman, Caretaker Committee. 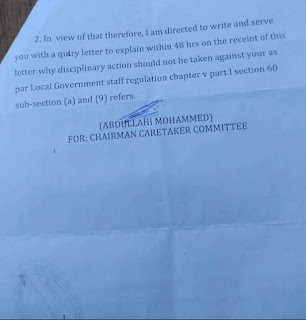 It is a query letter allegedly written to a staff that had in one way or the other gone against the stipulated rules of the Local government bye laws. 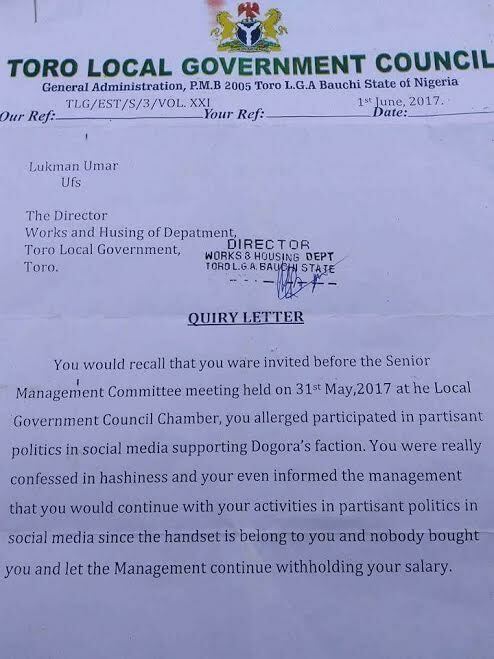 This query letter is already queried due to the grammatical and spelling errors that marry it. Aside the grammatical blunders, there are spelling errors I would love to pinpoint. 1. The spelling of query. It is spelt as "quiry" instead of "query". 2. "Alleged" is spelt as "allerged". 3. "Partisan" is spelt as "partisant". 4. "Harshness" is spelt as "harshiness". 5. "Receipt" is spelt as "receint". These are a few spelling errors I could see. The grammar on the other hand is something else. I don't even wanna delve into that. 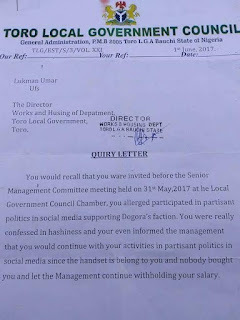 This is really pitiable, embarrassing and heart breaking! Unfortunately, these are persons who lead some group of persons. Who are we to blame for this? The typist or the writer? 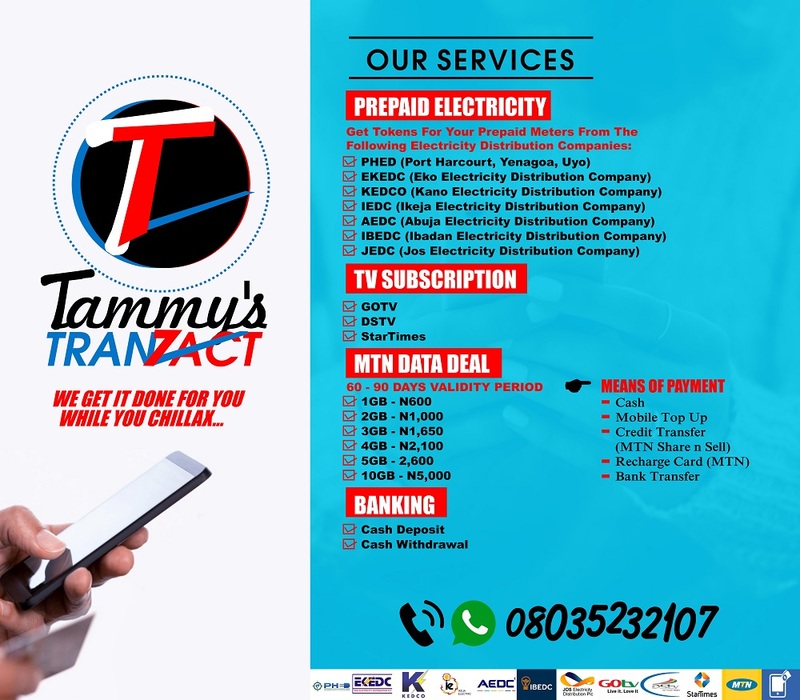 You would agree with me that the typist shouldn't be blamed for this because the writer must have made those blunders leaving the typist with no choice than type and print it exactly the way it was delivered to him/her. Some weeks ago i talked about how a jamb participant's score was different on two results and now am seeing this sort of embarrassing letter sent from high authority.